Friday nights are generally mama/baby nights in our house. It's the last day of a long week of us having to be apart during the days (me at work, her at daycare) and I try to spend as much time cuddling and playing with her as I can. For that reason, we tend to eat fish on Friday nights. Tonight it's salmon with spinach and toasted ciabatta bread. "Get the oil* in your pan screaming, but not smoking hot, Salt and Pepper the flesh side off the fillet and put that side down in the oil. Immediately give the pan a good shake to make sure the fish doesn't stick. Then put the pan in a screaming hot oven and pull it out in five minutes or so, depending on the size of the fish." 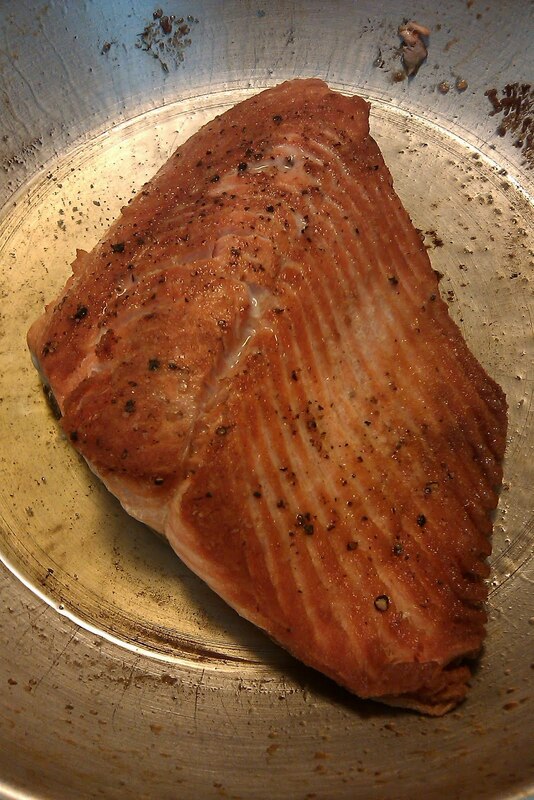 Fresh out of the oven, this is what my salmon looked like following those instructions. *I use Extra Virgin Olive Oil and use just enough to cover the bottom of the pan. 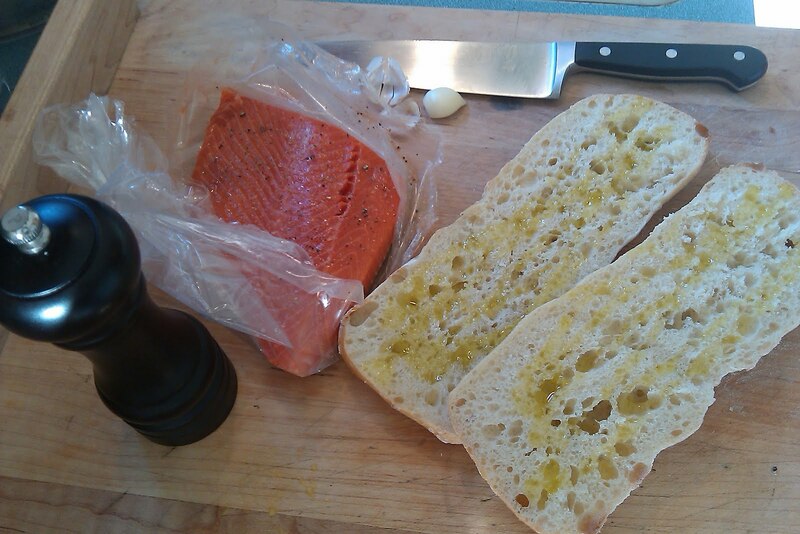 As soon as the fish was out of the oven, I put the bread in right on the rack. 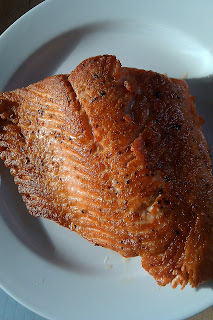 I had drizzled it with olive oil, and sprinkled some salt and pepper to give it some good, crispy flavor. 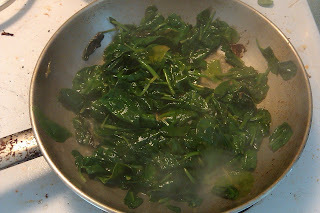 I wanted some quick greens, so I took the fish out of the pan, smashed a garlic clove and threw it in the hot oil, then dumped a bag of spinach on top of that. I turned it with some tongs in the hot oil a few times until it started to wilt, squeezed some lemon over it and added about 1/4 cup of water from the tea kettle. 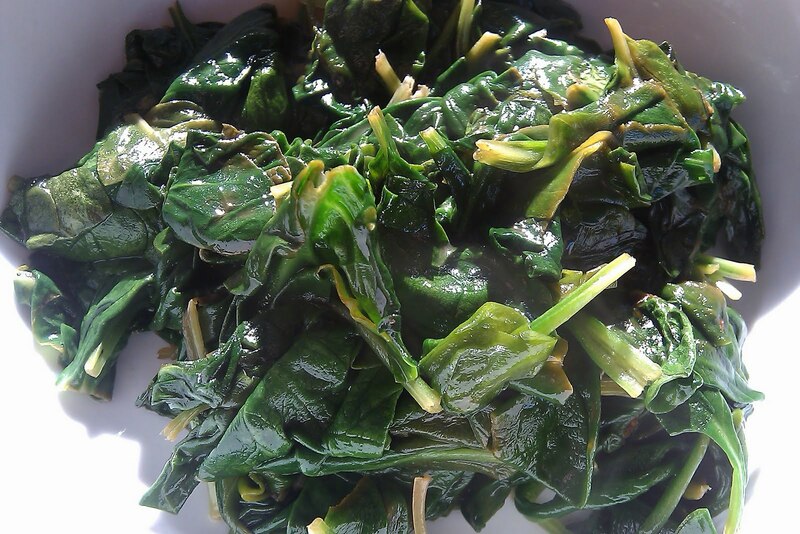 By the time the spinach was done the bread was toasted and dinner was served!! Give your kiddo a chance to season their own meal. 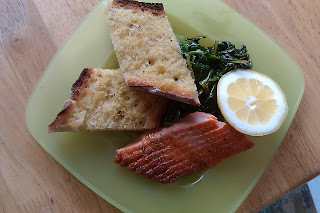 This meal I gave Lorelei a piece of lemon to squeeze on her fish, or her spinach, or her bread... her choice. For other meals I let her sprinkle Parmesan cheese, pour milk on her cereal, you name it. For little kids especially, having a sense of control over their meal really gives them a sense of ownership and pride in what they are doing. And, chances are they'll eat more of it! !